There are many options for getting to and from your Grand Canyon rafting adventure. The below options have worked best for our rafters. 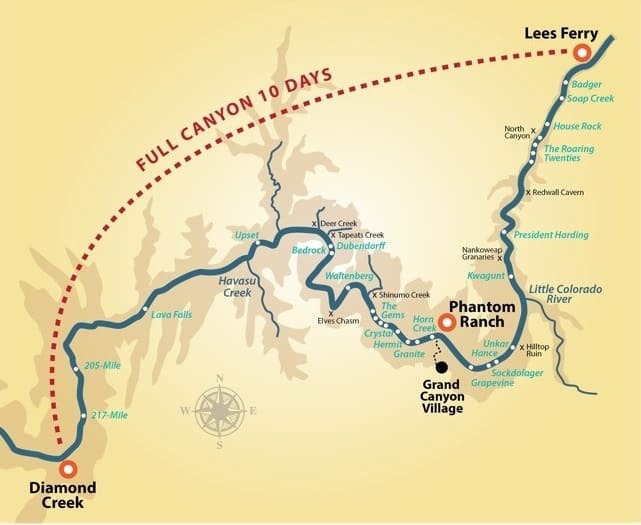 If you’d like to raft the entire length of the Colorado River through Grand Canyon in less than two weeks, this will be your adventure of choice! The motor adventure also tends to be the trip of choice for those who would like a more secure ride on a larger raft. We take all walks of life on our motor adventures, and pride ourselves in providing the ultimate whitewater adventure, even if it is on a bigger style raft! This is a great option for multi-generation families, for those who are a little leery of the big rapids and those who wish to unplug from everyday life for a little over a week. We often get asked what the best time of year to raft the Grand Canyon is, and our answer is always “it depends on what type of weather you prefer!” You’re going to get different weather every month. Some months are more variable weather-wise, whereas others are more reliable. Below is a general guideline as to what type of weather to expect each month on your Grand Canyon rafting trip. Our 10 day motor adventures are offered in early April and early September (the National Park Service does not allow motor boats on the river after September 15).